He had to show the others he was the greatest. The wisest. The master. He would confound them. Outfox them. They might have had the better equipment at their disposal: their spanking new 16 track mixing consoles. Top of the range. But they didn’t have the secret. That was God-given. They just wanted to get their records out there, and watch the money roll in. They didn’t have the soul for it. Or the knowledge. The sleight of hand. Those ghostly fingerprints. The supple imagination. The fearlessness. They would fail. He would surely triumph. Jah would make it be. Lee Perry. 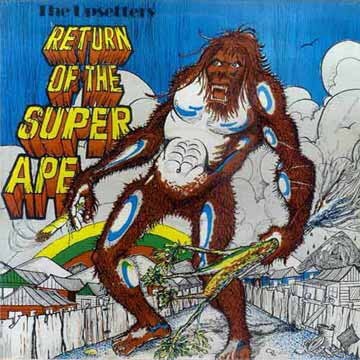 The Upsetter. Scratch. He gave the world Bob Marley and they pinched his protégé from under his nose. “Money talks”, he said. He invented dub, but the credit went to Tubby and the others. Rainford Hugh Perry had a few scores to settle. He wasn’t going to lose ground to Tubby, ‘Striker’, The Mighty Two, Coxsone, not anyone. Not anymore. And he wasn’t going to let Chris Blackwell’s opportunism finish him off. He was going to make music that would bewitch and mystify the world, create sounds beyond their reach. And so he did. It is the work Perry produced in his legendary home-made studio in Kingston, The Black Ark, which contains the greatest treasures of his prodigious output. Selecting a Black Ark Perry production for TNPC is not a simple task. Be as well doing it blindfolded with a yad. There’s that much good stuff to choose from. In between producing monumental reggae masterpieces such as Junior Murvin’s ‘Police & Thieves’, Max Romeo’s ‘War Ina Babylon’ and the staggering ‘Heart Of The Congos’ (to these ears the greatest reggae album ever made), not to mention engineering Dr. Alimantado’s classic ‘Best Dressed Chicken’ and taking time out to oversee The Clash’s ‘Complete Control’, Lee was doing his utmost to strip James Brown of his title of ‘hardest working man in show-business’, by simultaneously taking centre stage for a series of dazzling albums of his own. Of these, ordinarily it is ‘Super Ape’ from 1976 which gets top billing. ‘Return Of The Super Ape’, the last album Perry cut at The Black Ark before he burnt the studio to the ground, isn’t held in quite the same high regard. But in some ways it outshines its more illustrious older sibling, although any analysis of their relative merits might depend upon what it is you like most about Lee Perry’s music. Compare the lean, scrawny rabid-looking creature on the sleeve of ‘Return Of The Super Ape’ to the fearsome powerhouse with the more formidable BMI of the original. The sleeve paintings certainly provide us with a clue. ‘Super Ape’ is a robust, reverb-drenched masterpiece, the production sure and confident. It’s a heady mix, bearing a more homogenous and cohesive sound than ‘The Return’ which, by contrast, is one of those Perry albums that sounds thrown together almost as an afterthought, a sonic accident of raw impenetrable dubs, flippant singalongs and spectral passages shrouded in mystery. It could easily be mistaken for a collection of cast-offs from ‘Super Ape’ but it is so much more than that. The production is more varied, even if the mastering appears lopsided at times, like the sound of warped vinyl under a worn stylus. In other words, it is exactly the kind of Lee Perry album I love. Just how did he conjure those sounds? And from a primitive 4 track recorder. Well, magicians never reveal their secrets, but others have documented some extremely bizarre techniques and rituals at The Black Ark. Scratch would often carry out invocations, summoning the spirit of Jah by blowing ganja smoke over the tapes, spattering them with blood and urine, even burying them in corners of the studio gardens to protect them. He ran chicken wire around his drum booth and buried microphones under a palm tree, which he thumped to obtain that echoed bass drum effect. For good measure he added bells, screams, wails and cows mooing (apparently Watty Burnett’s baritone through a foil covered cardboard tube). There’s simply no-one else who went to such lengths to create their own unique sound. And here on ‘The Return Of The Super Ape’, we get the full range. Take for example the title track, a patchwork quilt of unearthliness which for the most part doesn’t really travel anywhere, but with Merlin at the mixing desk we are treated to a banquet of special effects – what sounds like a few magazines of machine gun rounds being rapidly discharged, bottles breaking, rubbery jungle reverb, moody sax buried low in the mix with Lee’s echoey (largely indecipherable) utterances, which stand in stark contrast to the crisp polished drum sound. The bass stays low, the bells jangle and the whole thing uncoils for a bumper dubby finale. Majestic. Elsewhere we have ‘Dyon Anaswa’ – a playful bass driven skank with curly guitar licks courtesy Earl ‘Chinna’ Smith, and the mischievous ‘Tell Me Something Good’, one of Lee’s iriest little rollers. Horns are almost choked out on the imbecilic but irresistibly funky ‘Huzza a Hana’ and ‘Psyche & Trim’ is a prowling slice of righteous serpentine soul. The greatest magic is to be found on ‘Bird In Hand’ – if the introduction was nicked from a 1950s Bollywood movie, yet it still somehow sounds like a mystical conference with Jah, a genuinely holy sound. ‘Crab Yars’ which follows, remains one of Scratch’s most perfectly realised instrumentals – a joyous, sweltering intoxicating reverb drenched groove which you don’t want to end. The music and production are here completely harmonious – to borrow a title from Augustus Pablo, it’s infectious exuberance sounds like genuinely ‘upfull living’. The finale ‘High Ranking Sammy’, is one of those Perry tracks which sounds like he was completely stewed doing the mastering – it has drop outs, slows down, speeds up – or is that just my pressing? Here, there’s a nod to another Perry masterclass – Junior Murvin’s epic ‘Crossover’. It is mindbendingly brilliant.